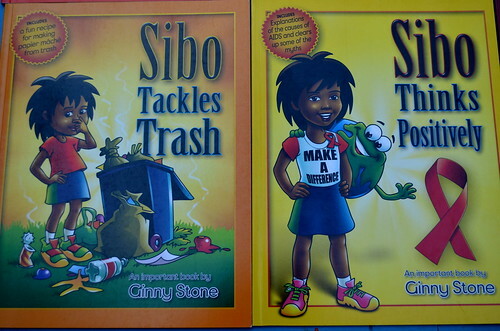 The books are all about a young gal called Sibo, who lives in South Africa… in each book she tackles a scientific issue, mostly green or environmental issues. Sibo is a bright and fun little girl, who would much rather go to the Wetlands for her birthday than visit a mall. She does get up to some mischief… taking her mums washing up liquid, she thought the silver nano-particles would brighten up her project!!! While the books are not strictly South African they are South African and it is really easy for our kids to relate to them… most of our science books are Northern hemisphere books, so it is really great to have books that are so applicable!!! Each book has a lesson or a theme and her mom is always a little reluctant to change their habits or begin a project. Sibo has to explain why they should do another green project. While her Dad is always keen to share a little more information for her projects… it makes a good balance: An explanation from a child’s point of view followed by an explanation by an adult… and then they usually do an activity or project together. At first glance my beginner reader blanched – so many words – until he realised all the books are written in rhyme, which makes them really easy to read and he felt like he was flying, he was getting through them so well. I have read these together with my younger kids over the last couple of weeks and they have really learnt a lot from them. I have to say I thought that science in a story would soften the lesson, but it didn’t at all. There is a lot to be said for raising ideas in a book and heaps of conversations following on afterwards. While typically the type of science book that we buy has lots of photographic detail and recommended experiments… these books are really picture books with great bright illustrations on each page. And I have to say my younger kids, were quite inspired to try things out for themselves. Nothing like a story to fire their imaginations up. I have no problem with little folks diving into projects and digging over the vegetable garden and watering their plants more carefully!!! The last page of each book contains a “Did you know?” page… with a couple of “actual factual” goodies… suggestions that you can do yourself, possible projects and often a helpful link to a useful site as well. The facts are pretty short and sweet not too hard for a beginner and enthusiastic scientist. 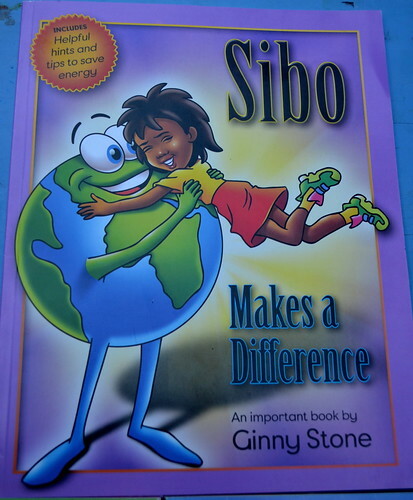 Sibo Makes A Difference: Sibo meets Mr Earthman at school and learns about the Greenhouse Effect. Sibo decides to make a few energy saving changes at home. 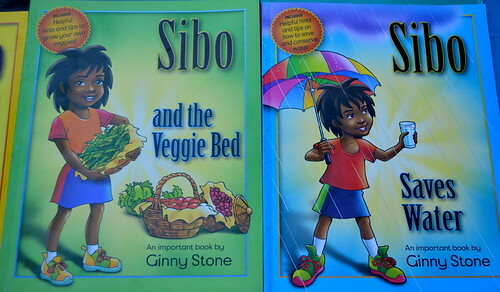 Sibo and the Vegi Bed: This book has great directions on how to make a door size vegetable bed in your back yard. What makes good compost and how to complete each step of the project. This book really inspired our kids to revive or over heated and fading fast vegetable garden!!! 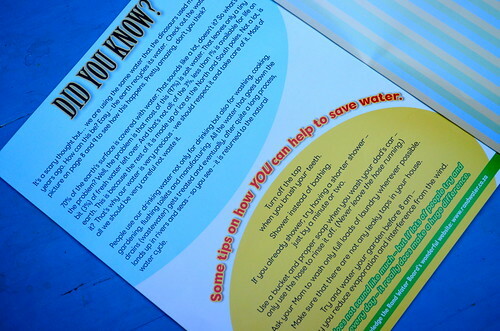 Sibo Saves Water: Sibo learns about the water cycle and learns that saving water can be quite a lot of hard work!!! She visits the wetlands for her birthday treat and our kids loved that because it is one of their favourite places to visit!!! Sibo and the Sea: Sibo’s family go on holiday to the seaside… Sibo is disappointed at how dirty the beach is. 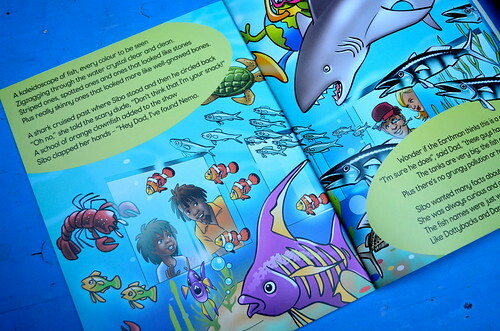 She learns about not eating fish off the red list… and has an interesting visit to the aquarium. Sibo in Space: Sibo is stargazing with her dad at bedtime, and then dreams about a journey through space… and a trip through the solar system… her teacher helps them understand about eclipses and this book answers all sorts of questions about stars, while Sibo learns to do research on her family’s computer. Sibo Sizes Things Up: If we had to pick a favourite then this would be it… It is about nano-particles and other teeny tiny objects. Sibo decides to look for something to liven up her science project and sees silver nano-particles on the laundry detergent… needless to say laundry detergent and school projects don’t mix. But I love how every day objects are used to introduce scientific topics!!! Sibo’s teacher invites a “nano-boff” to school to teach the children about nano-technology… they learn about electron microscopes, and nanobots. Sibo Likes Life: Sibo’s class learn about Biodiversity and how we need to protect all creatures on the planet for things to run smoothly. Sibo would like the laws to change to protect the environment more. And her dad suggest that they start to make some changes of their own and they organises a neighbourhood clean-up. 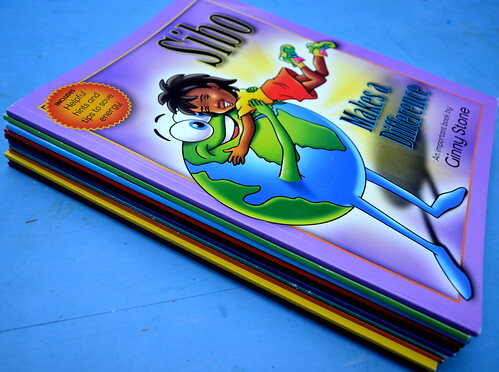 Sibo Tackles Trash: Sibo’s teacher is very strict about littering – no littering at all… because every single bit of litter adds up to a great big mess… Sibo decides it is not enough just to keep the classroom clean they need to take make their project bigger!!! 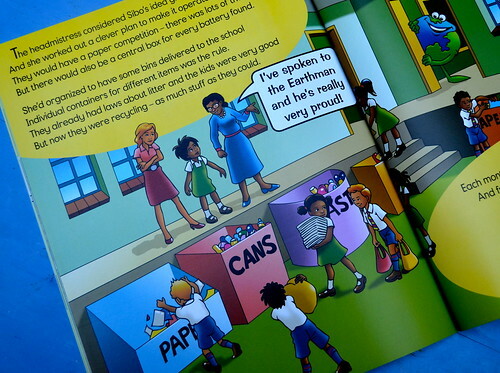 Sibo starts a “Reduce-Reuse-Recycle” project with her class and extend it to the neighbourhood… at the end of the book the children go on a neighbourhood clean-up and have a lot of fun. Sibo Thinks Positively: In a county where AIDS is so rife this is a good book for younger children to learn about the topic. Sibo has new neighbours a little girl in her class, and her big teenage brother is HIV positive. Sibo and her new friend talk about how he got AIDS – he went through a wild phase and got caught up in drugs and then he went to rehab and got clean… he now visits schools to tell school children about his illness. A lot of myths are dispelled in this book… you can’t “catch AIDS” from eating at the same table, using the same bathroom or being friends. You can help people who are HIV positive by being friends with them and making sure they eat healthy food. 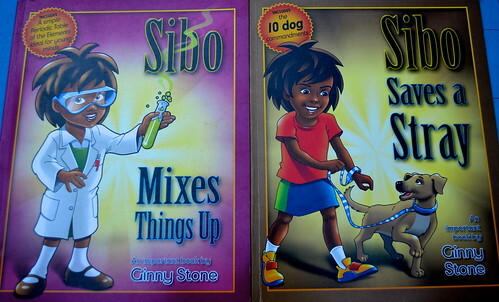 Sibo Mixes Things Up: Sibo makes a mess in the lounge with her blue milkshake and her friend comes over to help her clean it up really quickly before her mum gets in… SHe gets interested in the clean-up and asks her teacher all about chemicals. Her teacher explains all about the periodic table… and how elements are made up of atoms. And then they learn how chemical react together to make different mixtures… and they learn how to make a paper mache animal. Sibo Saves a Stray: Sibo finds a stray dog and really wants to keep it. Sibo learns how the animals are taken to the shelter and the sad truth that it just costs too much to care for thousands of abandoned animals. Sibo learns all she can about caring for dogs and then decides to ask her parents if she can keep and look after the dog she found. So what do we have to Give Away? 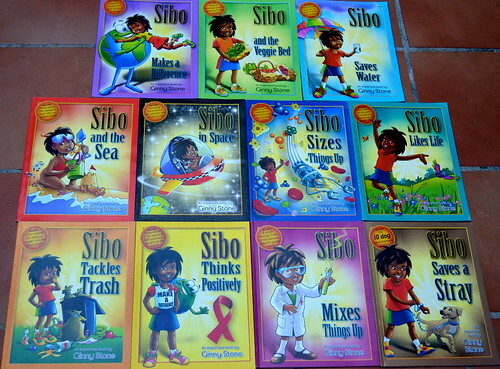 An entire collection of all the Sibo books, signed by the author!!! This GiveAway works in the usual way, comment before the end of Sunday, 27 January and we will draw and publish the winner after that. I won’t respond to your comments as I do on our other posts because I don’t want to be included in our own giveaway. Our GiveAways are open to everyone: If you have won a GiveAway before never fear – enter away. Good luck and get commenting!!! 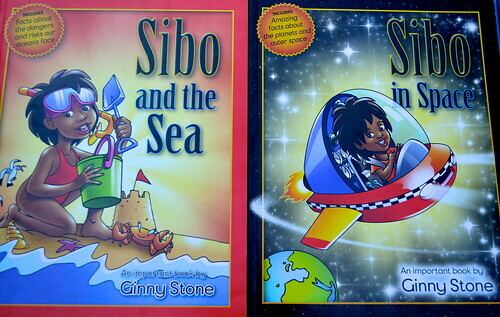 We would like to thank Ginny Stone and her Publishers for the collection of books. 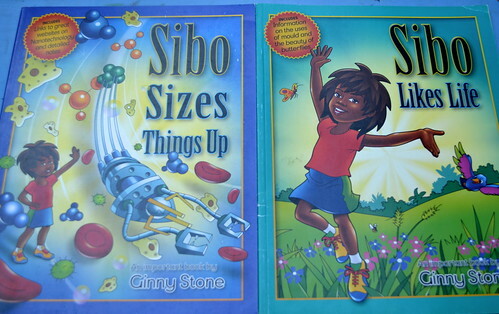 We received two sets of the Sibo books from Ginny Stone in exchange for an honest review. We were not paid in any way and the opinions expressed were entirely our own. Oh yes, please! Will be a wonderfull addition to our homeschool library. What a fun collection! Kids would love it! “I would be most content if my children grew up to be the kind of people who think decorating consists mostly of building enough bookshelves”, Anna Quindlen once said, but I also agree with Mark Twain who said: “The man who does not read good books has no advantage over the man who can’t read them”. So glad my children love to read! Science Books! These look like so much fun! Fantastic sounding books. What great reviews you have given them. Yes please!!! These sound absolutely fascinating, I would love to have these for our daughter as she is growing up.. These books look wonderful. Please include me! Wow! What a nice give-away! Love it! We love doing science experiments & these would be so fab to complement all our fun!!! This seems like a wonderful series – great prize! Nice and colourful. Also in keeping with Rsa and our culture.Got 3 homeschooling kids- 5,9,and 12. Was going to put kids in school, but we were turned away today, thankfully!! have been homeschooling for 6 years.Better to keep on doing what we’re doing in our own way! What a cute series and what a great giveaway. Count me (and my inquisitive girls) in! Yes please! We would love to receive these!! Count us in 🙂 please. what an amazing giveaway. Going to go out and find these books at a bookstore! Wow, these look very exciting and I know my kids would be thrilled to receive them. OOOH would love these!!! Looked at Christmas time for books for children about veg gardening and was sadly dissappointed….so these look great!! My little reader would love these! My youngest devours the Magic School bus books and these look to be on the same line. How fun. These look awesome. So colourful and exciting! Would really love these lovely books. Thank you for your “honest sharing”:). I am getting these anyhow. This looks like a fascinating little collection. We’d love them.